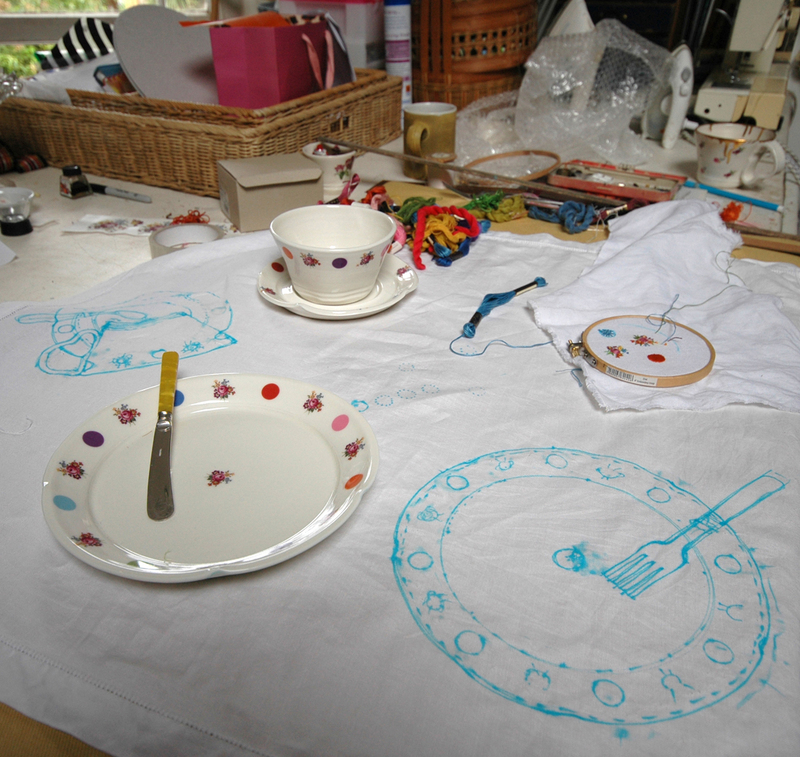 I have just spent a couple of days doing a proper embroidery – stitching flowers and spots onto a table-cloth for Hanne Rysgaard to display her ceramics. She is showing large selection of her current work in the Aberystwyth Arts Centre shop, from mid August to mid September. 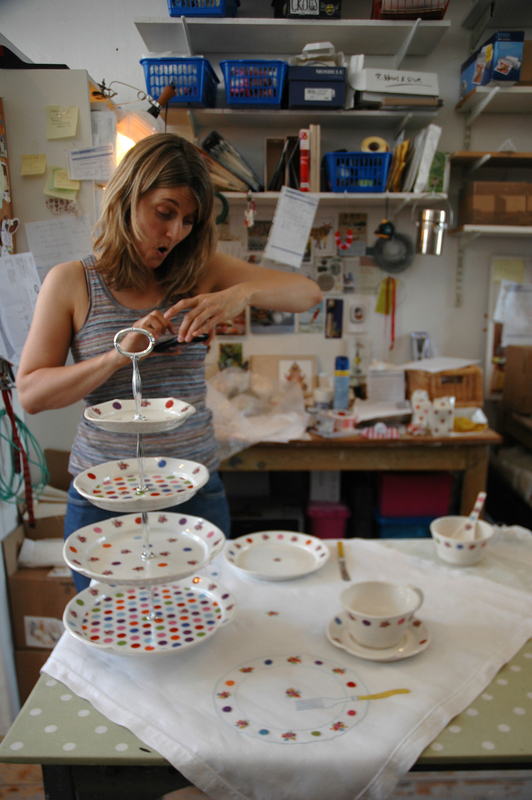 I offered do this the last time I was working in her studio, as she was just preparing to make all the stock for this exhibition. I thought that a stitched version of her pieces would make a good centre-piece for the collection. While speaking to her over a cup of tea, I put a few ideas down in my work-book; this is real “back of the envelope” stuff, using a ball point pen – which is always good to draw with, but the sometimes the line it leaves is a bit sleazy – and as often happens the very first idea was the one I used. Hanne immediately liked the whole idea, actually I think she just liked me drawing it out for her. But I do feel that when you get the initial idea for a piece of work, the first drawings, even if just scribbles, contain an energy that subsequent studies don’t, and if referred back to they can often re-assure you through the inevitable time when you doubt your decision to make the work. 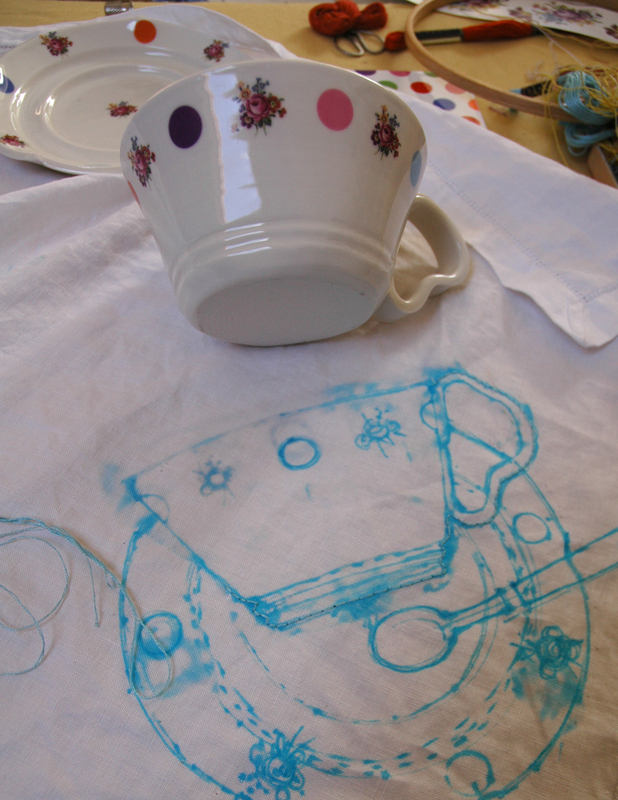 The next drawings were on the linen tea-cloth in water erasable pen, Hanne made the actual pieces for me to work from and I took them home to my studio and set them out to draw around. The tiny flower arrangement was quite a challenge to stitch, it was a bunch of roses and auriculas with a few forget-me-nots, quite difficult to copy within a 2 cm. spot and this had to be repeated 13 times…..by comparison the spots were easy-peasy though they are all slightly wonky. stitched sample for spots and flowers. While the flowers and spots had to be stretched for the embroidery I always prefer to stitch without a hoop and the outlines of the ceramics are freely stitched, so much easier to handle. 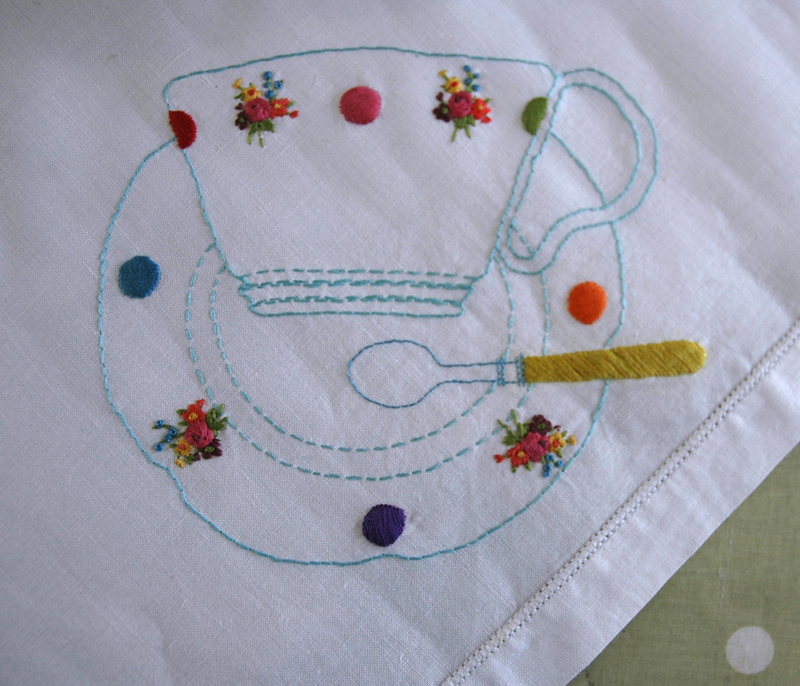 I feel that the hand stitching looks right for the hand-made quality of the ceramics. Once the embroidery was finished, washed and pressed I delivered it and it was a relief when Hanne just whooped with delight when she saw it. It was immediately set out at the back of the gallery/shop at Blaze, where we both set about taking pictures. 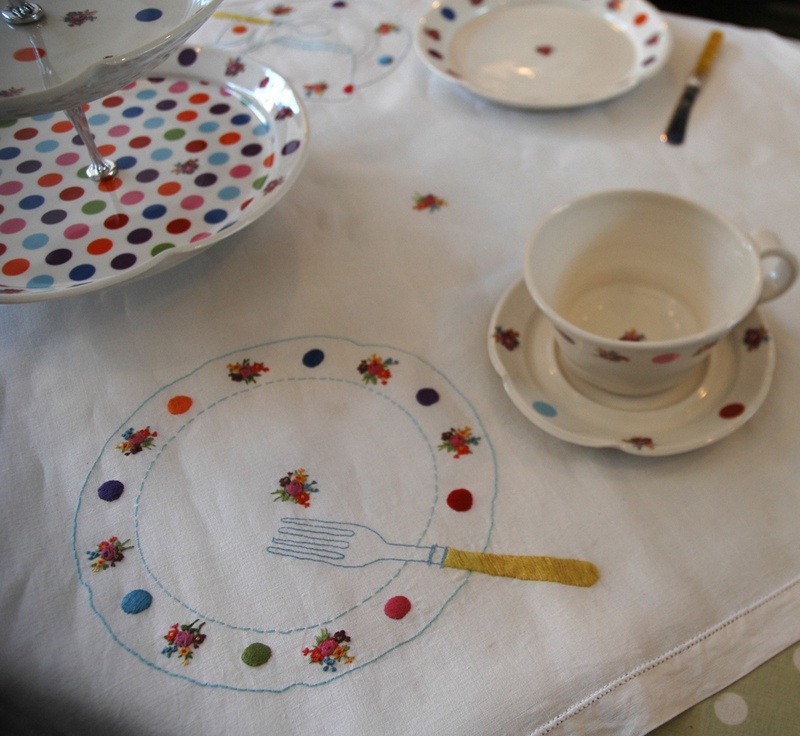 Here is a close up of a section of the cloth complete with the embroidered cake fork, the real butter knife used as the reference, can just be seen in the background. 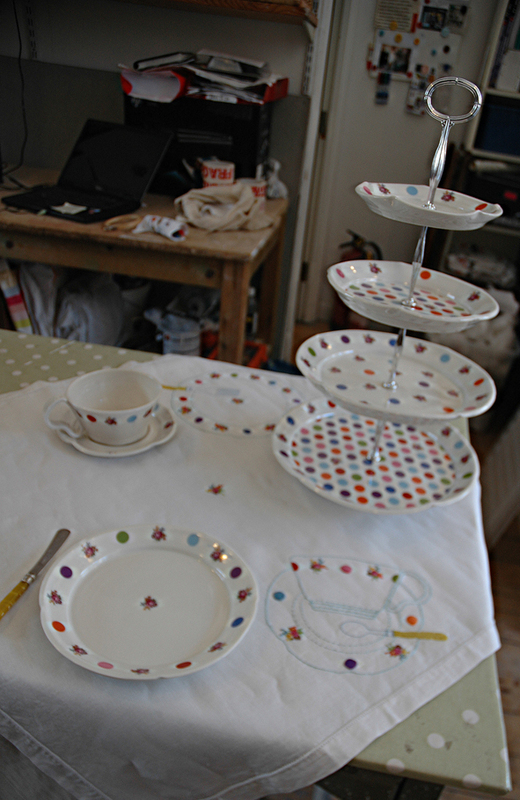 and here is a view of the whole set with the magnificent 4 tiered cake stand. Categories: Drawing, Stitching Ceramics | Permalink. What a great idea and what a great cooperation. Congratulations girls! 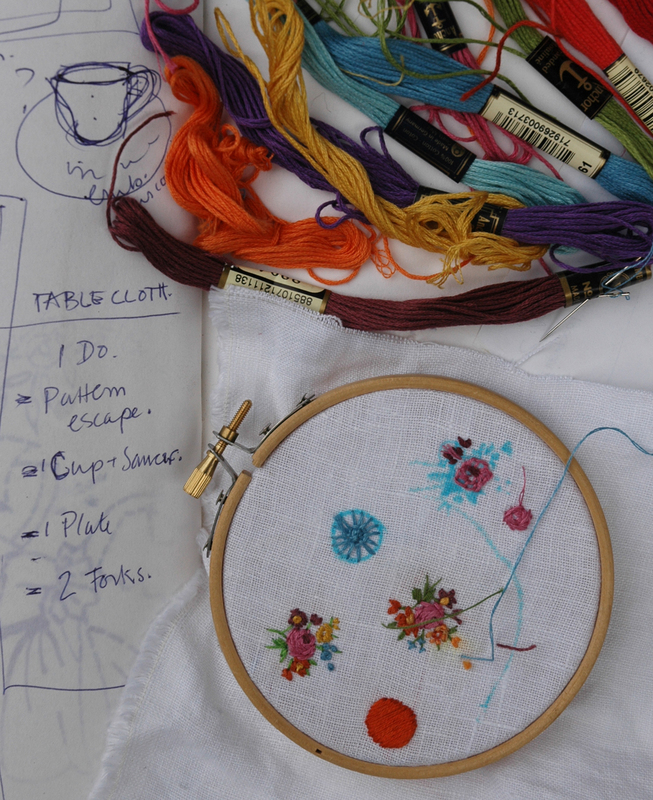 Hanne and I love that you call us girls….eventually I will get my CV onto the blog ….glad you like the new work, real traditional embroidery at last. Your common work is so full of pure joy that you have to be girls. I’ve had this feeling also looking at your enamel fabric – all those laces, thread work, delicacy (it’s hard to believe there’s metal involved) and hearts, pure girl (in the best meaning of this word)! 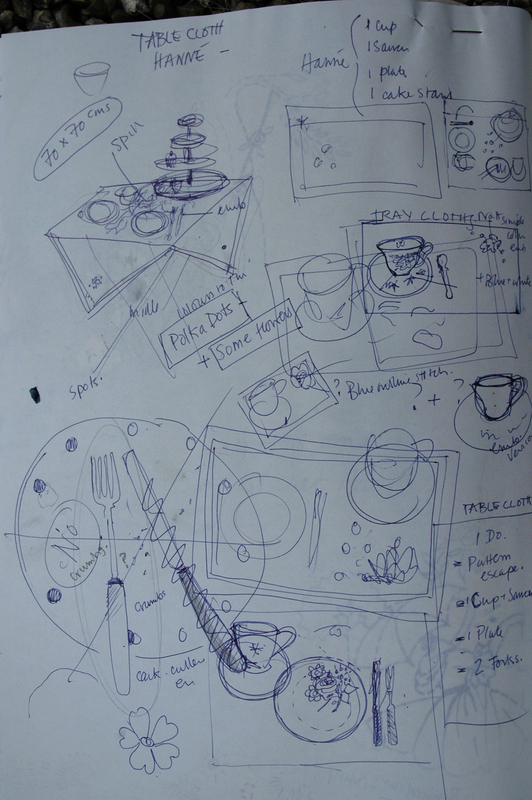 well – thank you Anton, good to hear from you and wait till you see our ceramics……..